In this study by Scally et al,1 the authors test a novel and intriguing hypothesis that the level of surgical skill, as judged by video review, can predict long-term outcomes (ie, weight loss and resolution of comorbidities) following Roux-en-Y gastric bypass (RYGB) for obesity. The authors have extensive experience in this method and build off a previous study2 examining competence in RYGB vis a vis individual surgeon video review. However, in contrast to most operations in which a specific disease process is extirpated (ie, tumor removal) and long-term outcome is judged on the basis of disease-free survival and quality of life, in the present study, long-term outcome success from RYGB is tersely judged by the degree of weight loss and resolutions of comorbidities. This distinction is important as it bears on the negative results of this study. 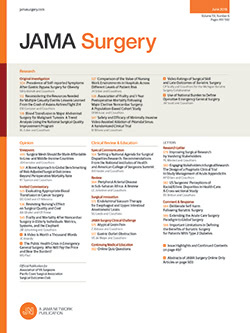 The authors recognize this when they stated, “These findings are somewhat counterintuitive because there is a well-known association between other proxies of surgical skill (eg, surgeon volume) and most measured outcomes.” Yet, in considering RYGB as the test procedure for the current study, the authors have set themselves up for a negative study based on the many years of experience with this procedure and the emerging evidence that weight loss and resolution of comorbidities following RYGB is more a function of the neuroendocrine/microbiome consequences of the gastrointestinal construction than its actual geometry. While the authors admitted that technique itself (eg, pouch size and limb length) was not addressed in the present study, their rationale for studying skill alone was based on the possibility that complications (ie, leaks) could impair long-term results. However, this was not the case.